Any company that relies on the group-chat service Campfire to manage workflow could use a chat bot to automate everyday tasks like finding images -- or fun things like giving a quote from a movie. GitHub, where millions of developers store and share code, loved its Campfire bot Hubot so much the company rewrote the code and just made it open-source. given over the last year. A lot of people built their own but we thought it'd be cool if people ran their bots on the same foundation we were using." GitHub's Ryan Tomayko wrote the original Hubot code. Corey says rewriting Hubot's core functionality took engineer Rick Olson about a day, but finding the availability of other engineers to prep for release added another month or two. He notes that Hubot "always took a backseat to our day to day tasks." Corey acknowledges developers can choose from numerous Campfire bots, but "we figured people might gather around ours if we made it available." He adds, "Hubot also supports multiple backends, campfire and IRC for now, so people can share scripts across multiple chat systems." One of the most interesting things GitHub has done with Hubot: make him unlock the front door for someone at their old office. "It was a simple web service based around an Arduino hack," says Corey. "I'm more excited to see what our users come up with though." GitHub users love GitHub's launch of open-source Hubot. Comments to the Hubot blog post include "I've been looking forward to this for a while, thanks so much!" and "Thanks for open sourcing this. Now we can all wait for Hubot and Siri to get it on." The Hubot project already has 420+ developers following it and 55 forks. Six months ago, GitHub's Zach Holman explained why the company hacks on side projects like Hubot: they help incorporate new employees, provide a productive distraction to official projects and strengthen company culture. Writes Zach, "More than once I’ve found myself hitting a wall, switching gears to Hubot or a few other GitHub projects, working heads-down for an hour or three, and then discovering I’m ready to slaughter the original problem I had." 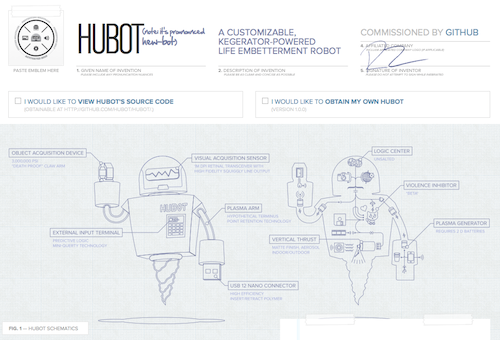 In this example of Hubot, the bot does conversions, returns images and provides a list of rules.